Smoking increases an individual’s risk of developing tuberculosis, or TB. Smoking also makes the infection worse, because it causes vital immune cells to become clogged up. This slows their movement and impedes their ability to fight infection, according to new research published in the journal Cell. Russell Berg and Steven Levitte, graduate students in the Medical Scientist Training Program at the University of Washington in Seattle were the lead authors of study. The senior author was Lalita Ramakrishnan, formerly of UW Medicine and now in the Department of Medicine at Cambridge University in the United Kingdom. TB is an infectious disease caused by Mycobacterium tuberculosis. The pathogen primarily infects the lungs, but can also infect other organs. It is transmitted from person to person through the air. The disease can cause breathlessness and wasting, and can lead to death. While treatments do exist, the drug regimen is one of the longest for any curable disease: a patient will typically need to take medication for six months. For people exposed to TB, the biggest risk factor for infection is exposure to smoke from active and passive cigarette smoking and from burning fuels. This risk is even greater than co-infection with HIV. However, until now it was unclear why smoke should increase this risk. When TB enters the body, the first line of defence it encounters are immune cells known as macrophages (Greek for ‘big eater’). This type of cell engulfs the bacterium and tries to break it down. In many cases, the macrophage is successfully prevents TB infection by killing the pathogen. In some cases, however, TB manages not just to avoid destruction, but also to use macrophages as ‘taxi cabs’ to drive deep into the host, thereby spreading the infection. TB’s next step is to cause infected macrophages to form tightly organized clusters known as tubercles, or granulomas. Once again, the macrophages and bacteria battle. If the macrophages lose, the bacteria use their advantage within this structure to spread from cell to cell. The international team of scientists reporting this week in Cell studied genetic variants that increase susceptibility to TB in zebrafish, a ‘see-through’ animal model for studying the disease. They identified a mutation linked to lysosomal deficiency disorders. 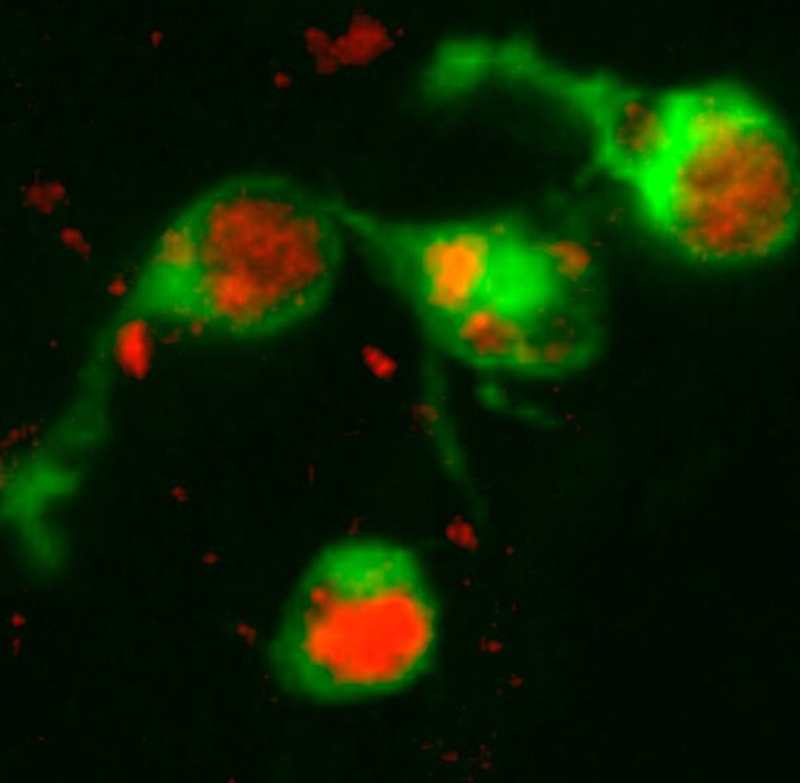 The lysosome is an important component of macrophages responsible for destroying bacteria. This particular mutation caused a deficiency in an enzyme known as cathepsin, which acts like scissors within the lysosome to chop up bacteria. This mutation, however, would not necessarily explain why the macrophages could not destroy the bacteria, as other enzymes could take cathepsin’s place. The key, the researchers found, lay in a second property of the macrophage: housekeeping. As well as destroying bacteria, the macrophage also recycles unwanted material from within the body for reuse. Lysosomal deficiency disorders were preventing this essential operation. Ramakrishnan, the study’s senior author, explained: “Macrophages act a bit like vacuum cleaners within the body by vacuuming up debris and unwanted material, including the billions of cells that die each day as part of natural turnover. But the defective macrophages are unable to recycle this debris and get clogged up. They grow bigger, fatter and less able to move around and clear up other material. The researchers looked at whether the effect seen in the lysosomal deficiency disorders, where the clogged-up macrophage could no longer perform its work, would also be observed if the lysosome became clogged up with non-biological material. By ‘infecting’ the zebrafish with microscopic plastic beads, they were able to replicate this effect. “We saw that accumulation of material inside of macrophages by many different means, both genetic and acquired, led to the same result: macrophages that could not respond to infection,” explained co-author Russell Berg. This discovery then led the team to see whether the same phenomenon occurred in humans. Working with Joe Keane and his colleagues from Trinity College Dublin, Ireland, the researchers showed that the macrophages of smokers were similarly clogged up with smoke particles. This observation helped explain why people exposed to smoke were at a greater risk of TB infection. Also contributing to this research were David Tobin from Duke University, Cecilia Moens from the Fred Hutchinson Cancer Research Institute, C.J. Cambier and J. Cameron from University of Washington, Kevin Takaki from University of Cambridge, and Seonadh O’Leary and Mary O’Sullivan from Trinity College Dublin. The research was supported by the National Institutes of Health, the University of Washington Medical Scientist Training Program, the Wellcome Trust, the National Institute of Health Research Cambridge Biomedical Research Centre, the Health Research Board of Ireland and The Royal City of Dublin Hospital Trust.